Goat is found from Kashmir to Kanyakumari. Goat rearing in India is mostly done for meat production. Goat of beetle breed found in the province of Punjab is the goat giving more milk. In this post we will learn briefly about the different breed of goats in India. Goat to be found in Kashmir. 1) Kashmiri breed goats are found in the mountainous areas of the northern province of India. 2) The temperature of that place is very cold due to the northern India's Himalayan Mountains. 3) In Kashmir there is snowfall, so at these places goats have too much hair on their body. To protect the Kashmiri goat cold weather, nature has provided this protection to them. 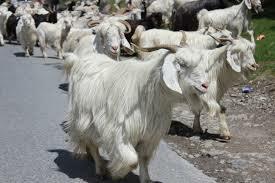 These goats are easily accessible to high altitude in Kashmir's mountainous regions. 4) Kashmiri goat has shielded itself according to the weather in Kashmir. The atmosphere of Kashmir can be from 40 to -40 degrees; Kashmiri goat is also comfortable in this difficult environment. 5) Kashmir goat is a relatively small species, and it looks quite beautiful and attractive. The height of the adult Kashmiri goat reaches around 60 cm, the total body length is about 1.5 meters. There is a beautiful, curved medium-sized head looking like an eagle beak, and ears are big and hangy.